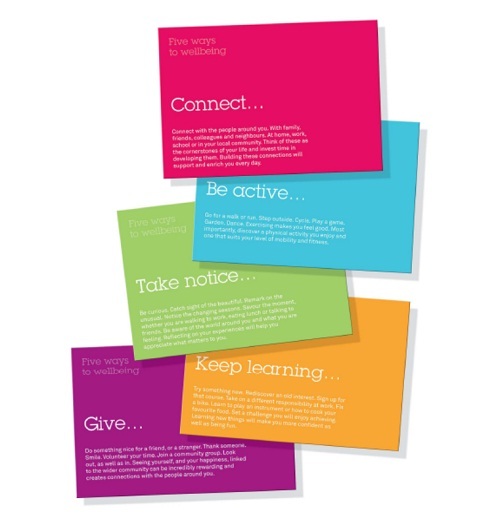 I really like the idea of the '5 Ways to Wellbeing' - 5 simple things to incorporate into our lives to promote our physical and emotional wellbeing, and you can do them all for free. • Ask how someone's weekend was and really listen when they tell you. • Put five minutes aside to find out how someone really is. • Hold a 'tea and talk' for the team at work. • Give a colleague a lift to work or share the journey home with them. • Go for a walk or run at lunchtime or after work. • Take up a new physical activity, such as swimming or cycling. • Take the stairs instead of the lift. • Take the kids to the park after school. • Get a plant for your workspace. • Have a 'clear the clutter' day. • Take a different route on your journey to or from work. Learning new things will make you more confident, as well as being fun to do. • Sign up for a class – you could learn a language, do something creative or even take a formal education class such as English or history. • Learn to play an instrument or how to cook your favourite food. • Read the news or a book. • Set up a book club. • Do a crossword or Sudoku. • Research something you've always wondered about. Seeing yourself, and your happiness, linked to the wider community can be incredibly rewarding and will create connections with the people around you. • Hold a fundraising event for a charity or organisation. • Do something nice for a friend. • Join a community group. • If you're going shopping, ask a neighbour if they need anything. Source: Foresight Mental Capital and Wellbeing project *(2008). The project commissioned the centre for well-being at nef (the new economics foundation) to develop 'Five Ways to Wellbeing': a set of evidence-based actions to improve personal wellbeing.